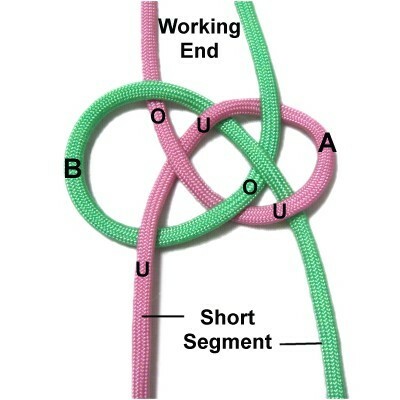 Description: The Bush Bar is a unique decorative knot suitable for many Macrame projects. 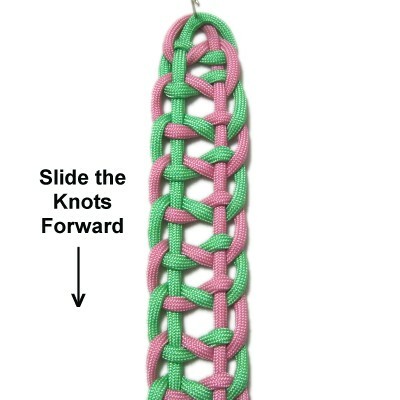 Kids will find this knot easy to tie, so it can be used for a craft party or a school art project. 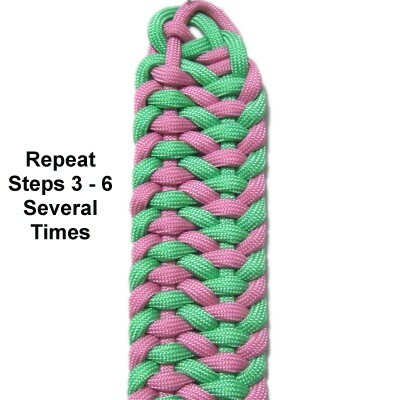 You can use it to make Macrame bracelets and chokers, belts, purse straps, dog collars, and more. It's usually tied with the knots close together. 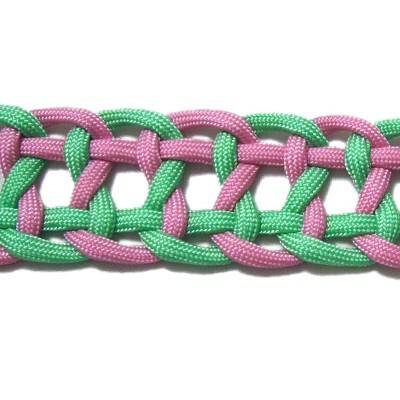 But you can expand the knots to add space and create a more open weave. 2018 Update: The beginning steps are changed so two colors can be used. 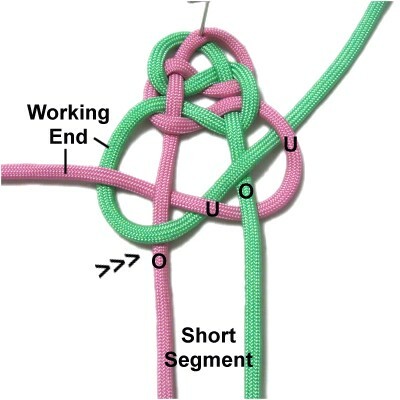 The knots are no longer tied around a loop. The bracelet shown below is still tied around a loop, so view that page to see the original version. 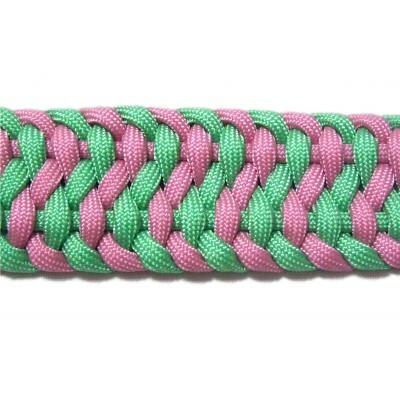 After you have practiced this knot, try making the Bush Bar Bracelet. It's an easy project suitable for beginners. 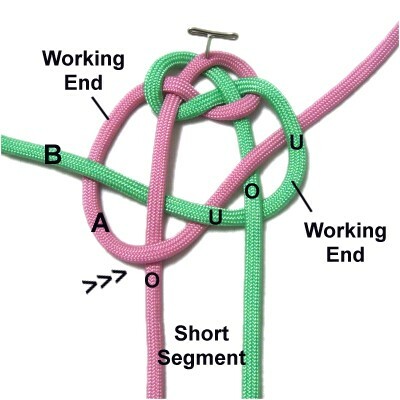 I found the Bush Bar on the Fusion Knots website. 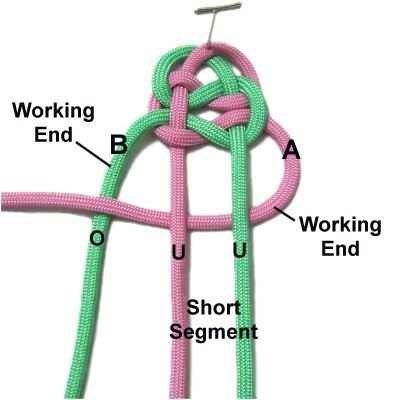 The video gallery contains tutorials for a variety of very unique and appealing knot designs. Preparation: To practice, you need 2 cords at least 60 inches long. 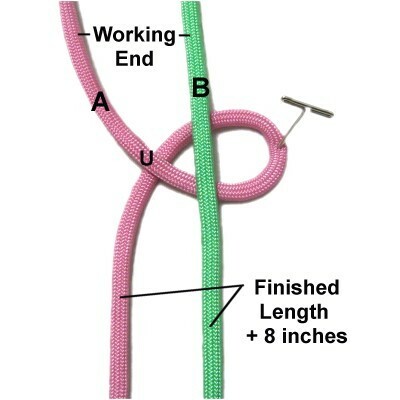 Close Weave: Both cords should be the finished length x 10. Open Weave: The cords should be the finished length x 8. Measure both cords starting from one end down to the finished length you are planning to make. Add at least 8 inches if you plan to make a button knot for a clasp. This measured portion is called the short segment in the instructions. The rest of the material is called the working end. Step 1: Secure both cords vertically close to the measured point. Cord A should be on the left. Make a counter-clockwise loop with the short segment of cord A, passing under the working end to form the crossing point. Slide the loop under cord B. Start a clockwise loop with cord B (short segment), passing under the short segment of cord A, and over the working end of cord A. To complete the left loop, pass it under the right loop, over cord B, and under the right loop again. Step 2: Tighten the Sailors knot so the space in the center is 3/4 to 1-inch in size, if you plan to use it as a clasp. 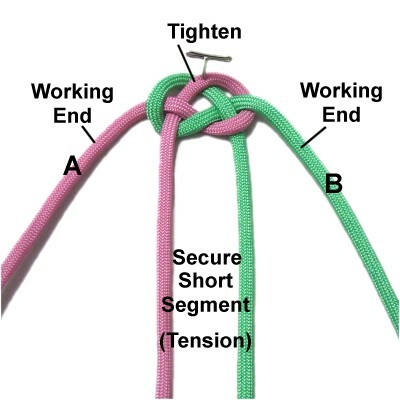 Secure the short segment of both cords with tension. Step 3: Curve the working end of cord B to the left horizontally, passing it under the short segment of both cords and over the working end of cord A. Step 4: Curve the working end of cord A to the right, passing over the short segment of cord A. Moving diagonally, bring it under the working end of cord B, over the short segment, and under the working end again near the curve. Step 5: Tighten the knot made in steps 3 and 4 so it's close to the width of the first knot (step 1). Curve the working end of cord A to the left, passing it under the short segment of both cords and over the working end of cord B. Step 6: Curve the working end of cord B to the right, passing over the short segment of cord A. Moving diagonally, bring it under the working end of cord A, over the short segment of cord B, and under the working end of cord A near the curve. Designer's Tip: Steps 5 and 6 are the same as steps 3 and 4, but the cords have switched positions. As you continue, just repeat the over - under sequence rather than focus on the colors. Step 7: Repeat steps 3 - 6 several times if you are practicing. Continue until you reach the finished length if you are making a project. Keep the knots close together as you build the bar. Step 8 (optional): To create an open weave, slide the knots forward while holding the short segments so they remain straight and taut. Then measure the length of the sennit. 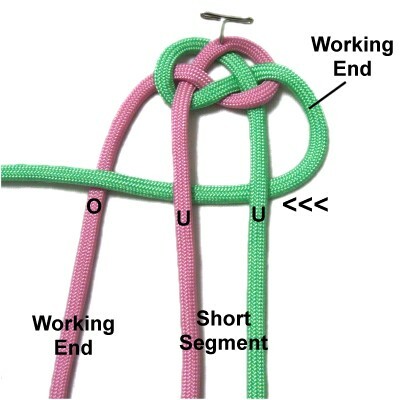 You may need to remove a few knots to make it the right length for your project. Step 9: Secure the working ends in the BACK of the Bush Bar. 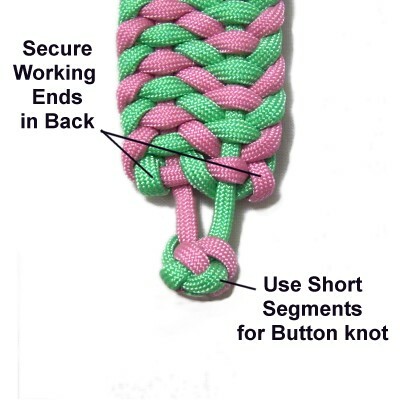 Use the short segments to make a button knot if you need one for a clasp. The Knife Knot is the one shown in the image. Have any comments about the Bush Bar? Contact Me.